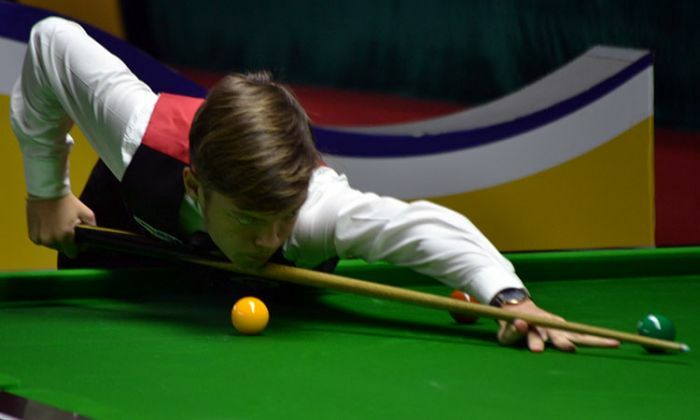 Austrian No.1 and World Snooker No.3 Florian Nuβle has reached in the pre-quarterfinals of World Under-18 Snooker championship. Last night after completion of round-robin stage, the top-20 selected for the knockout round. Having lost a match and four frames, Florian finished No.2 in his group and placed to play match of last-20 stage. Today morning his match was against Indian player Karmesh Patel that he won 3-1. The first two frames were comparatively easy and he won 89-01, 81-08 but in third frame Karmesh made a comeback to counter him with 65-35. However, Florian was in comfortable zone and once again he played well controlled shots to win the fourth frame 50-10 and moved ahead to pre-quarter finals. Belgian player Julien Leclercq also reached in the Last-16 stage. He beat his compatriot Sybren Sokolowski 3-1. He also crafted a century break of 114 points in the second frame to defeat Sybren. Chinese boy Yi Ze Wu must be happy to join other six Chinese qualifiers into the Last-16 stage. Yi Ze defeated Kissada Chumjit of Thailand 3-1. Sean McAllister of England is the fourth player who entered in the pre-quarter finals from Last-20 stage by winning the sea-saw battle against Hong Kong boy Yun Fung Tam 3-2. Both played a tight game and shared good safety resulted in no big break but ofcourse high scoring.